Rochdale have appointed caretaker boss Keith Hill as their new manager until the end of the season. 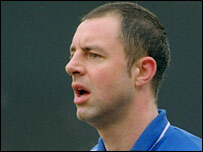 The 37-year-old had been in charge of the team since the departure of former Steve Parkin on 16 December. Hill, who played more than 150 games for the club, said: "I have thoroughly enjoyed the last couple of weeks." Dale, who are currently 19th in the League Two table, are just one point above the relegation zone but have won their last games 4-0. And Hill added: "I'm looking forward to the future. "It is something I've always wanted to do since I retired from playing and it's nice to be given the opportunity to continue the job I started. "I wouldn't say it's too early because I am mentally prepared to do the job. "We are at the wrong end of the league table and we have to be positive about the future."